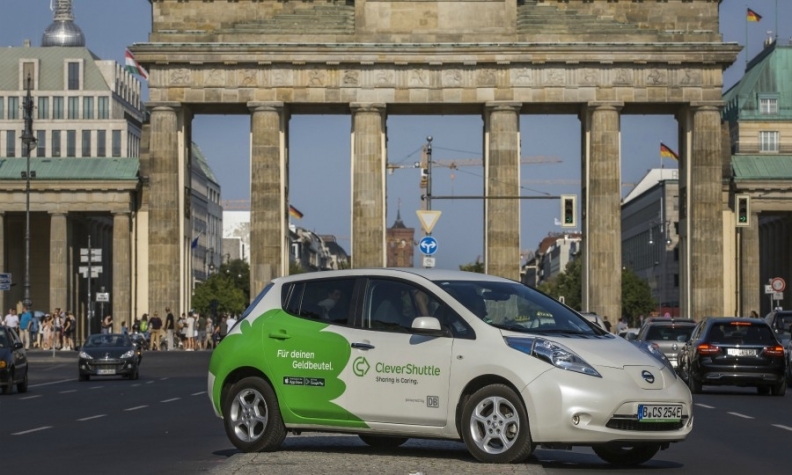 One of CleverShuttle's battery-powered Nissan Leafs is pictured in front of the Brandenburg Gate in Berlin. BERLIN/MUNICH -- For years, Martin Bruesch was a typical car owner. He routinely used his Audi A4 station wagon for the 20-minute trip to the office in Berlin. Now on work days his car usually stays parked outside his apartment in the affluent neighborhood of Charlottenburg and the 32-year-old human resources executive hails a new car-pooling service instead. "If I'm truly honest with myself, then owning a car is too expensive with all these alternatives around," Bruesch said as he got into one of CleverShuttle's battery-powered Nissan Leafs one evening this month. As young people like Bruesch increasingly ditch driving, they're also accelerating the shift toward what's being dubbed “peak car” — a time in the not-too-distant future when sales of private vehicles across the West will plateau before making a swift descent. This is especially true in big cities where people are becoming more inclined to share rather than own a vehicle that sits idle most of the time. The number of Germans 25 and under getting driving licenses slid 28 percent in the past decade, and it's a similar story in pretty much every other major economy. It's a moment of reckoning for an industry that had been able to count on three things since the automobile was invented in Germany more than a century ago: cars ran on combustion engines and people not only desired to own one, they also drove it exclusively. With the age of car-sharing, battery-powered fleets and self-driving cars upon us, automakers need to reinvent themselves into mobility companies to survive. It's hardly surprising, then, that Daimler bought a stake in CleverShuttle after it began operations in 2016. The service uses an Uber-like app to pair individuals searching for a ride with other commuters in the same vicinity. In the five German cities it runs, users have more than doubled since January to 650,000. Fast forward just five years and such services will eat into automobile sales, leaving automakers vulnerable if they don't find ways to augment their income, according to Munich-based consultancy Berylls Strategy Advisors. By 2030 in the U.S., where data is most readily available, Berylls predicts that total sales of cars – individually owned and shared – will fall almost 12 percent to 15.1 million vehicles. "It will be the first-time carmakers ever have to deal with a decline that's structural, and not down to temporary factors like an economic downturn," said Arthur Kipferler, a Berylls consultant who, while working for Jaguar Land Rover Automotive, helped close the deal to fill Alphabet's planned self-driving Waymo taxi service with 20,000 electric I-Pace crossovers. Problem is, it's not as simple as replacing car sales with revenue from mobility services. While German heavyweights like Daimler, BMW and Volkswagen Group have invested hundreds of millions of euros in various ride-hailing and car-sharing schemes, they're nowhere near breaking even on them. Take the DriveNow car-sharing service BMW started in 2011, which charges users by the minute to rent more than 6,000 BMWs and Minis in 13 European cities. After seven years, it's still turning a loss, and last year made up just 0.07 percent of the company's sales. The rest came mostly from selling almost 2.5 million luxury vehicles, such as the BMW 3-series sedan. And yet BMW's own estimates show that in a decade, one car-sharing vehicle will replace at least three privately owned ones, and mobility services, including autonomous cars, will account for a third of all trips. According to New York-based consultancy Oliver Wyman, mobility will be a 200 billion-euro ($227 billion) business by 2040. "Carmakers are desperate for their mobility divisions to be monetized," said Michael Dean, a senior automotive analyst at Bloomberg Intelligence. "They must be involved in future mobility to avoid being left behind by the likes of Uber and Lyft." Already, Uber and its Chinese rival DiDi Chuxing are together valued at about $124 billion—just shy of BMW and Daimler's combined market value, he said. So much is at stake that BMW merged DriveNow with its long-time arch rival Daimler's car2go service in March. Their goal: to build a one-stop-shop where people can do everything from call taxis, locate parking spots and find charging stations for their electric cars. "As pioneers in automotive engineering, we will not leave the task of shaping future urban mobility to others," Daimler CEO Dieter Zetsche vowed when the partnership was announced. Competition is already fierce. In Germany, the plethora of options to get from A to B led the nation's train operator Deutsche Bahn to buy a stake in CleverShuttle which, for some commuters, is a viable alternative to overcrowded trains. A similar smorgasbord of mobility options is available in most big cities. Car-sharing fleets globally have increased in size by 91 percent in the past year, according to Bloomberg New Energy Finance. Hailing services like Uber, Lyft or Grab—all of which automakers have invested in—reached nearly a billion users during the second quarter, it said. Shuttling with strangers, the latest fad, is also catching on. Aside from CleverShuttle, ViaVan started in London, Amsterdam and Berlin in the spring as a joint venture between Daimler and New York-based Via Transportation. Volkswagen, too, in July launched Moia in Hanover, Germany, using 35 VW-designed electric vans and growing to 250 by 2020. "We must reduce inner-city traffic," said Bruno Ginnuth, CleverShuttle's CEO. "A good way to do that is convincing people they don't need to own a car anymore." Commuters are relishing in the choice. Bruesch pays about 8.50 euros for the four-mile journey to Berlin's central square Potsdamer Platz, half the price of a taxi and less than what garages near his office charge for parking. "It's cheap, I don't need to search for a parking space, and I like the fact that a trip is environmentally friendly," he said.